This article is about creating a slideshow video with your photos and transferring it to your computer via Wi-Fi using Photo Slideshow Director HD. Make your own picture video with music, transitions, theme and other effects will be an interesting way to share photos with friends. Photo Slideshow Director HD can help you do that without doubt. Besides, it can help you transfer finished picture video to computer wirelessly with its built-in Wi-Fi Transfer. 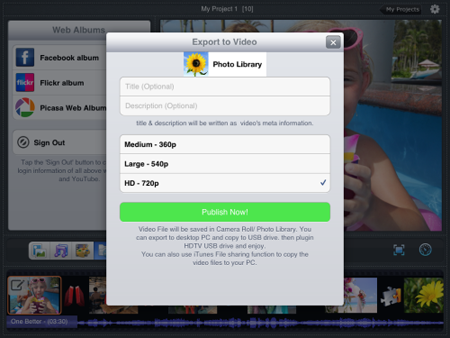 So you can transfer your photo slideshow video to PC/Mac without cable or any other apps. Note: Before transferring via Wi-Fi, please make sure that your iPad and computer and using the same wireless network. Step1. Make a slideshow with your photos and save it to Camera Roll using Photo Slideshow Director HD. After customizing the slideshow, tap the Export icon to show the available sharing choices(Learn how to make a wonderful slideshow). 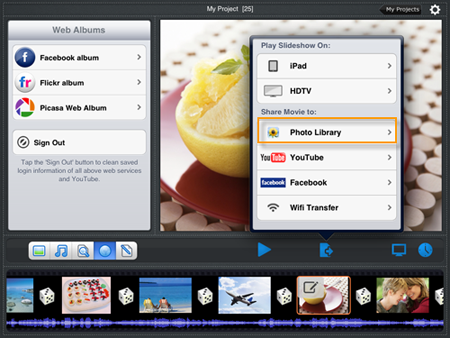 Choose sharing movie to “Photo Library” to save the photo video to Camera Roll. Step2. In the “Export to Video” dialog box, enter the title and description for the video, then choose the video resolution and 720p is recommended. Tap “Publish” and the app begins to encode the video. After encoding is finished, it will save the video to Camera Roll automatically. Step3. Tap “Export” icon again, and choose “Wifi Transfer”, then a Wifi Transfer dialog box will show up with a URL address. Step4. Type the URL in your computer(PC or Mac) browser address bar correctly. The video list that can be transferred will show on the screen. Right-click the name of the video to download and save it to your computer hard drive. As its name implies, it is an app which can be used to create photo slideshow. With its YouTube and Facebook sharing functions, you can upload your photos to YouTube and Facebook in a form of slideshow video. And also you can also watch your photo video in TV with this app.